It is unusual to start a blog with a farewell, but I thought I would post the eulogy that my sister and I gave for our Grandfather, who died just before Christmas. We stand here today as the eldest of Grandad’s five grandchildren and we would like to spend a few minutes sharing Peter’s early life and adventures followed by our own memories of Grandad, which I hope will highlight just what a truly special man he was. Peter was born in 1919, the eldest of four children, to William and Ellen Sargeant, a working class and practical family of blacksmiths. Peter’s brother Don is here today. He went to Little Baddow Primary School and was a good student. It was here, aged seven, that Peter met his future wife Jean Ager when she and her sister Betty joined the school. Jean sat at the desk in front of Peter and at that time their friendship was limited to Peter pulling her hair to get her attention; but she soon became his childhood sweetheart and a growing friendship with Jean’s brother Bernard enabled Peter to visit the family more often. In his spare time, Peter made some pocket money working on local farms plucking chickens, gathering potatoes and picking peas in addition to helping his parents with the chores; collecting water daily from the spring and getting fresh milk from Holybread Farm. 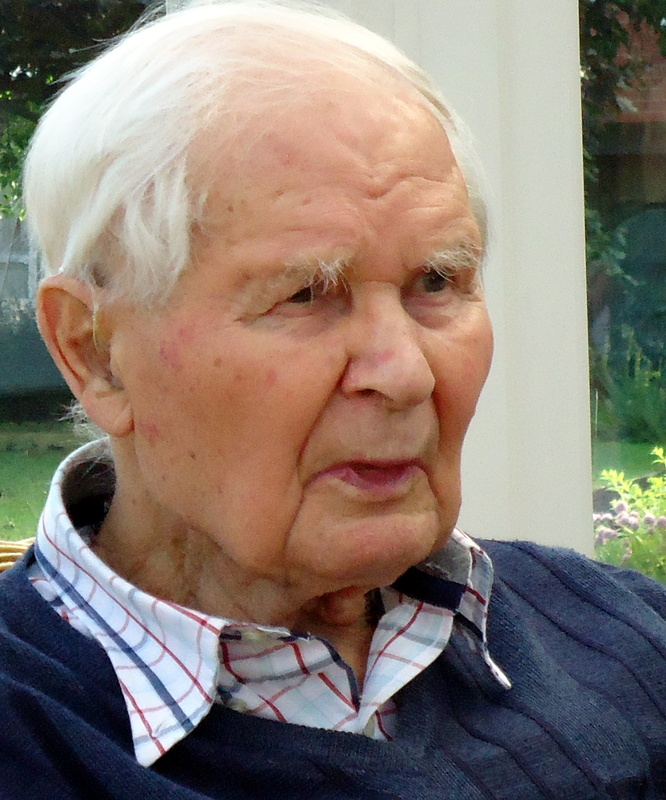 His education continued at King Edward’s Grammar School and in 1936 Peter secured his first proper job at Marconi’s before being called up for military service, aged 20. Peter has always said that the Army was the making of him, and as a country boy, his time in the military gave him the opportunity to travel widely, opening his eyes to the world around him. After basic training at Woolwich, he became an Instrument Technician in the Royal Electrical and Mechanical Engineers, earning three shillings and three pence per day. When the war broke out, Peter was first sent to Cairo and later Tobruk, Alexandria, Benghazi and Tunisia as part of General Montgomery’s 8th Army, culminating in the battle of El Alamein where the Germans surrendered in large numbers after being outflanked. He adapted well to life in the desert, enjoying the climate and especially the camaraderie. As in any war, moments of frenetic activity are surrounded by long periods of immobility, and Peter used these quiet periods to indulge his mischievous personality. 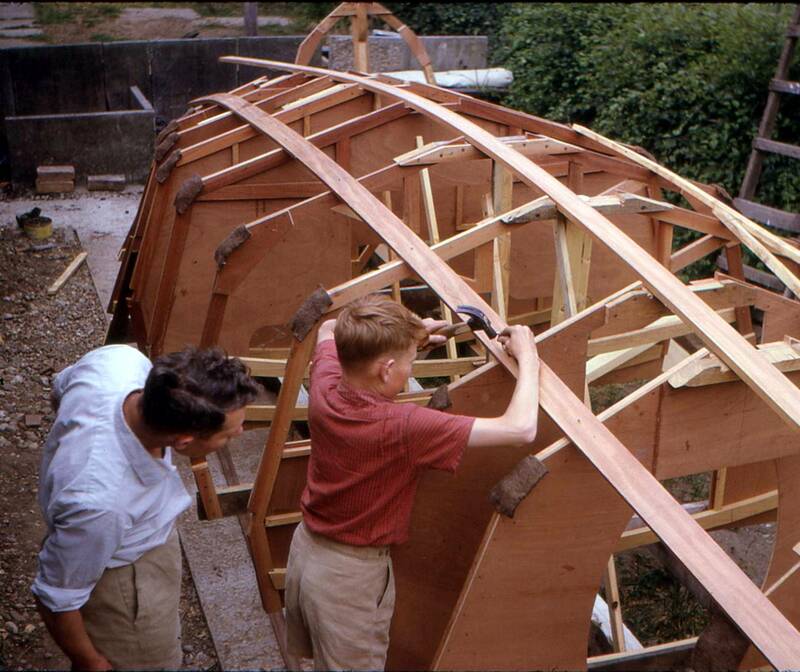 Having learned how to build a canoe during his school years with Bernard, Peter and a friend decided to build one from scrounged materials to paddle on a nearby lake, on which there were many ducks. Just as the canoe was ready to go, they found a Vickers heavy machine gun in an old air raid shelter, and decided to mount it on the front of the canoe so they could shoot some of the ducks. So, having removed any non-essential parts to make it lighter, they fixed it to the front of the canoe and set off across the lake. Opening fire on the ducks, Peter recalls a terrible din of bullets hitting the water, which drew quite a crowd on the bank. When they returned to shore, both men were arrested and at Courts Martial the following day, they were sentenced to five days Confined to Barracks, but complimented on their ingenuity. Peter then returned to Cairo for a technical promotion course which he completed as top student, and he wore the rank of Staff Sergeant for the remainder of the War. Brief spells in Algiers, Rome and Naples followed before returning home to Little Baddow in April 1945, five years after he had left. Using the excuse of heavy bags, and being dropped over a mile from home by the bus, Peter called in at the Ager’s house, to see Jean of course. Things took off from there and they married a year later in Little Baddow church. Peter and Jean were married for 60 years before Jean passed away in 2006, a shining example of a love that really did last a lifetime. 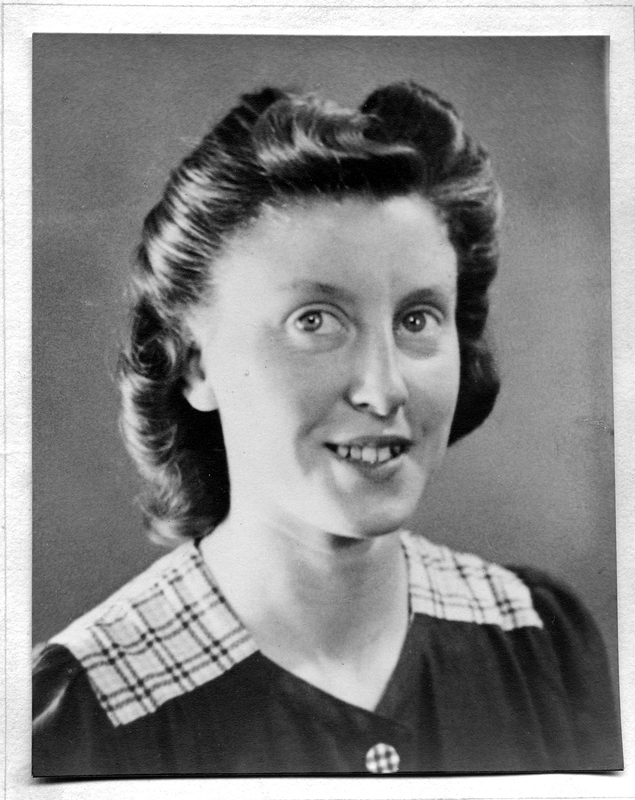 Peter was a true romantic and wrote scores of poems to Jean over the years, and more recently to the staff at Boucherne. At the end of the war, there was little accommodation available, so Peter and Bernard bought some old army huts and used the parts to build the Coleham End bungalows on land owned by one of Jean’s relatives. Peter and Jean spent 17 years living at Coleham End and this was where their sons, Alan and Mick, were born. 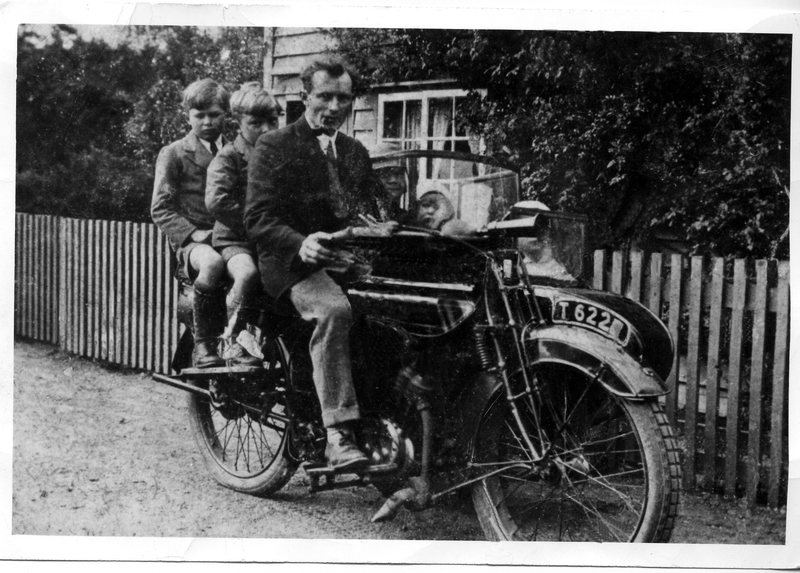 Childhood memories include building boats in the garden – Twitty Fee and Silvertip, and the purchase of the first family car, a Morris 8, which replaced the motorbike and sidecar they had used previously. 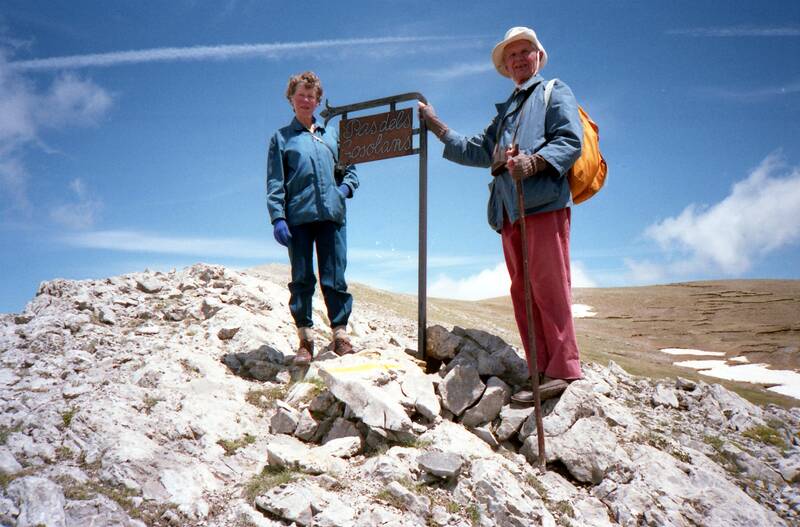 Family holidays began as camping expeditions in the UK followed by continental trips to the mountains, which Peter and Jean both had a deep love for. He continued to attend night school to get his chartered engineer status, having secured a job with Hoffmans after the War. Whilst at Hoffmans, Peter made a hugely important contribution to ball bearing research, which established the company as the world leader in their manufacture. He also attended language classes and became fluent in French, German, Italian and Spanish – regularly wandering off on family holidays to practice with the locals; skills he later determined to pass on to us grandchildren with, I’m sorry to say, limited success. Peter and Jean were fortunate to be able to buy the land to build Sweeps Hill and the family moved in 1965 when the main house was finished, having been built to Peter’s exacting requirements, but to a tight budget. Mick and Alan were recruited to help build the garage with a shift before school each morning. Several years later, Peter and Jean were able to indulge their love of the garden with the purchase of the adjacent field. Peter researched specimen trees whist Jean did the detailed implementation plan. All the greenery you see today is from their garden at Sweeps Hill. Peter retired at the age of 63 and like his two sons have found, he was busier than ever. As finances became more comfortable, Peter’s enjoyment of the finer things in life started to emerge, resulting in the purchase of several cars (a Lancia, an Alfa Romeo and finally two BMWs) and dinners where he created show stopper desserts from the Harrods cookbook…Jean was left to clear up! They enjoyed a variety of classical music on the best equipment and Peter continued to sing at every opportunity, to any available audience. 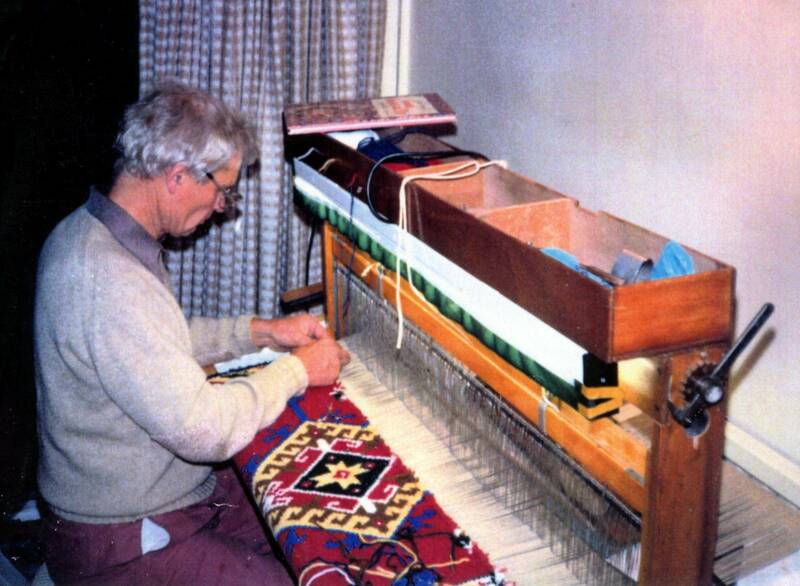 He also designed and built a loom on which he wove four middle-eastern style carpets for family members. It’s at this point that Ali and I can take up his story with a few memories of our Grandfather. As young children, both Granny and Grandad were very active and whilst Granny persisted with teaching us our times tables and how to tie our shoelaces, Grandad was more interested in making sure we could hang from our toes on the climbing frame, jump over a stick held in both hands or know how to build a good bonfire. This backfired slightly when Grandad returned me home to Mum one day, aged three, minus my eyebrows and her wooden stool, which were both casualties of an excellent bonfire. Another happy memory is of being taken to the ford at Little Baddow to paddle and fish using Granny’s old stockings as a net and jam jars to store the minnows. Grandad was a wine lover and we were introduced to alcohol at a young age. I can attribute my first drunken experience, aged 7, to Grandad. We were at Sweeps for a family celebration and the usual parental check on our customary ‘splash’ of wine had failed. After a full glass of Wine Society champagne, we spent the rest of the afternoon running around wonderfully lightheaded and rolling down the grass bank by the terrace. We were always encouraged to comment on the quality of wine we tasted, by looking at the size of the bubbles or the legs on the glass. If in doubt Grandad suggested we say “very nice, but rather dry”, a line we have always remembered and still use today. Grandad loved to challenge us; he had a huge sense of fun and an imagination to match. For birthdays or Christmas, pound coins were concealed in chocolate wrappers or hollowed out wooden logs; bicycle licences were issued after passing a test around the garden; and mastering a headstand earned a five pound reward. A footpath walk would come with compass bearings and paces, leading us to a lone tree with a Kit-Kat buried in the ground, or biscuits waiting for us in the Holly House. Grandad turned his passion for engineering into child friendly activities which kept us outside all day – digging enormous Australia holes on the beach, building dams across the stream on the Heather Hills, archery in the field with homemade bows and arrows or just letting us sit on his lap to drive the car, the lawnmower or ride his motorbike around the garden. We all know Grandad served in the War but what some of you might not know is that since building Sweeps, Grandad was fighting a war on the home front too. I talk of course, about the squirrels. Grandad would sit alert in his deck chair for hours, air rifle in hand, ready to shoot any unsuspecting squirrels who fancied a walnut. The trouble was, the squirrels were always deeply suspicious of Grandad and laid low when they saw him coming. Not to be outfoxed, Grandad altered his tactics to isolate the walnut tree by cutting down surrounding foliage, and made a whole range of ingenious anti-squirrel devices which were fitted to the trunk. In my opinion, never was a squirrel less concerned about where its next meal was coming from, and the population at Sweeps Hill continues to flourish. I expect they miss his challenges too. Talk of wildlife bring us on to Percy Fox. Grandad’s imagination led him to write us a series of short stories involving a naughty young fox called Percy, who got into all sorts of trouble around Little Baddow. New chapters arrived as type written booklets for notable Birthdays and remain one of our favourite childhood memories. My own daughter Sophie was given her first Percy Fox story by her Great-Grandfather last year and we will make sure that the story continues to the next generation of Sargeants. Grandad’s last book was written at Boucherne, entitled “How Percy got a flea in his ear”. Grandad was incredibly patient with his Grandchildren and regularly indulged our childhood dreams. I once requested a bespoke wooden camping box, complete with a ‘double combination lock’ to keep my sister out. Grandad obliged, drew up some plans and involved me at all stages of the construction. His patience extended to the blue swivel chair in the sitting room. We would spend hours spinning each other around in it and rather than stop us from messing about as most surely would have done, Grandad encouraged us to experiment and explain what happened when we pushed our legs out or sat taller in the chair when it was spinning. He was also a prolific artist, in both paintings and sculptures, many of which are in our homes and in the gardens of Sweeps Hill today. Grandad Peter was a very special man; gentle, thoughtful, firm in his beliefs and ideals and incredibly proud of his family. In time, our sadness will pass, and we will be left with the very best memories of an inspirational friend, brother, father and grandfather who we are all incredibly fortunate to have known and loved all our lives. The space he leaves in our hearts is huge, but we are thankful that he was so happy at Boucherne, surrounded by family and such kind care staff, and that at the end he wanted nothing more than to be with Granny again. And so, as was often the case in life, the last words here come from Grandad himself. I had a lovely life, which was largely formed by my association with my Mum and Dad, my School, the British Army and my wife Jean; I wish to commend them all. To my family, of whom I am very proud, and my daughters-in-law lovely ladies all, to my sons Alan and Mick, my Grandsons and Granddaughters and also my great grandchildren; I die a happy man, who loved music, sunshine and beauty, and enjoyed all of these. Peter.